“The next step is to do GC myself. That's my main goal. I won a stage in the Giro but I want to try GC now - that's my characteristics." 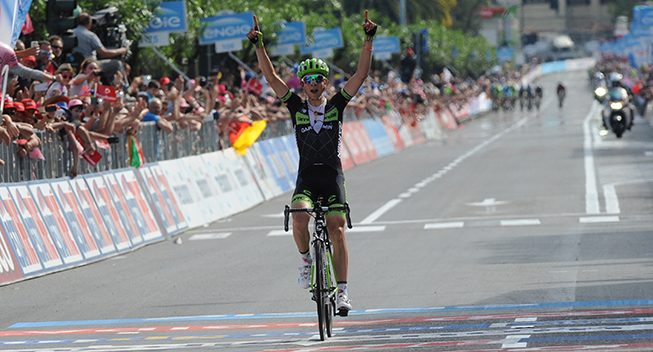 At the end of 2014, when the Italian Cannondale team disappeared and the American sponsor joined the team of Jonathan Vaughters (then Garmin), Davide Formolo was the icing on the cake for American team as he was one of the very promising Italian riders, seen by some as a potential future winner of grand tours. He won even the fourth stage of the 2015 Giro in La Spezia ... and with class. Since then the Italian has been more discreet but he continues its progression. Last September he finished ninth in the Vuelta. Now 24 years old, he wants to be leader but also admits to being heavily penalized by his shortcomings in the time trial. “The next step is to do GC myself,” explains Formolo in a long interview with CyclingNews.com . “That's my main goal. I won a stage in the Giro but I want to try GC now – that's my characteristics. “ We'll see. I did a good job in the Vuelta, I was there supporting every day. At the moment there's no stress – I'm training well and doing all things good. Then we'll see at the start of the Giro what my level is. The problem for Formolo is the time trial. “Time trialling – that's my weakness,” he acknowledges. “You could see in the Vuelta it was pretty bad – I've always been bad at it, actually. Formolo told CyclingNews.com that he will have a program identical to 2016, with one exception. The Tour de Romandie will be replaced by the Tour of the Alps (formerly Giro del Trentino) and Liège-Bastogne-Liège. In 2016, he started at the Volta a la Comunitat Valenciana and the did the GP Industria, Tirreno-Adriatico, the Tour of Catalonia and finally the Tour de Romandie.